Baking Soda | What's Green with Betsy?!? Spring is here! Whether it feels like it or not, there is a psychological lift to just spotting a crocus or a daffodil and knowing that winter is officially over. It may be too early to start gardening, but it’s not too early to start a thorough spring-cleaning! If you don’t already use non-toxic cleaners, now is the time to switch! Indoor air pollution, partially caused by the use of chemical based cleaners, is a much more serious problem than people realize and one of the reasons for increased cases of asthma and allergies, among other diseases. Fortunately you can find several brands of greener, ‘‘cleaner” cleaning supplies at your local grocery store; many of the conventional brands are now making a less toxic product as well. Be sure to read the ingredients though; some products claim to be “natural” when they really aren’t. Visit Environmental Working Group’s Cleaners database to check the toxicity of your brand and for the lowest toxicity cleaners. Seventh Generation, Mrs. Myers, Ecover, are a few good ones. Remember, you really don’t need a different product for each surface in your home. That’s just marketing. All-Purpose Cleaner: Mix 1/2 cup vinegar and 1/4 cup baking soda (or 2 teaspoons borax) into 1/2 gallon (2 liters) water. Store and keep. Use for removal of water deposit stains on shower stall panels, bathroom chrome fixtures, windows, bathroom mirrors, countertops etc. Keep out of reach of children. Cheap, effective and OG (the original “green”), baking soda bakes, cleans, heals, disinfects, scrubs, deodorizes, exfoliates, and brightens just about everything in the home. But did you know baking soda works in the garden too? I recently came across the following fabulous tips from plantcaretoday.com. Mix 4 teaspoons of baking soda and 1 gallon of water. Use on roses for black spot fungus and also on grapes and vines when fruit first begins to appear. Powdery mildew is causing major problems with impatiens this year, but also can be a problem for other plants, like lilacs, cucumbers, squash and zinnias. Mix all the ingredients together and spray plants weekly. Apply on overcast days to prevent any potential foliage from burning. Mix in 1 gallon of water, 4 teaspoons baking soda, 1 teaspoon biodegradable soap. Mix well, spray infected foliage or soil as needed. Pour or sweep baking soda in a thick layer into cracks on a sidewalk or patios. The baking soda should kill any small weeds already sprouted and prevent new ones from coming up. Mix equals parts flour and baking soda and dust plants (cabbage, broccoli, kale) being eaten by cabbage worms. They munch on the leaves and die usually in a day or two. Repeat as needed. Simply wet the crabgrass, pour a heavy dusting of baking soda on the weed. The crabgrass should start dying back in 2 or 3 days .CAUTION: When applying baking try NOT to get it on your grass as too much baking soda can burn and kill it. After a day in the garden and dirt, clean your hands by rubbing and scrubbing wet hands with baking soda. Rinse. Another simple recipe to combat powdery mildew on cucumbers, zucchini, melons, roses, and lilacs. 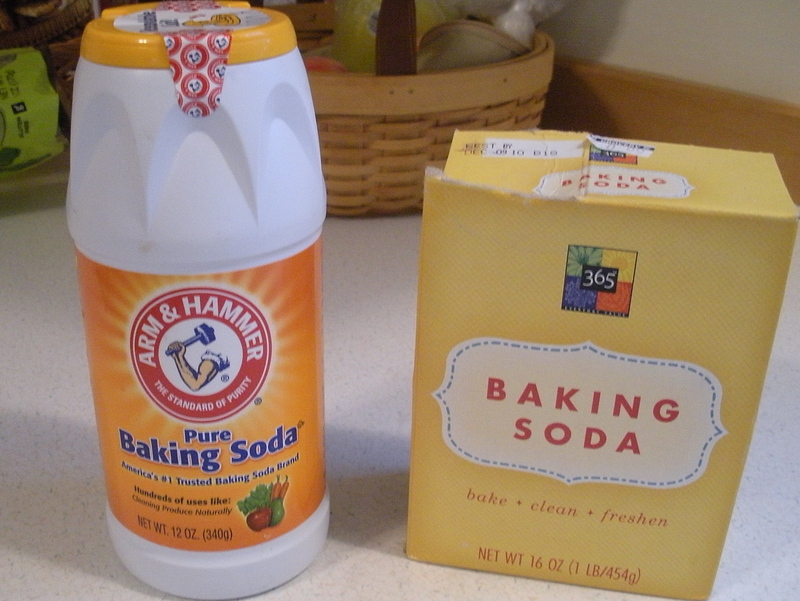 Fill a spray bottle with 1 teaspoon baking soda in 1 pint water. Spray as needed. 9. Test your soil PH. Wet the soil and take a small amount of baking soda and sprinkle it onto soil. If the baking soda bubbles, your soil is acidic with a PH level under 5. You clearly can’t go wrong with tried and true baking soda, in the home and garden! Below is a question from a reader about Swiffer. I just got the latest issue of Vermont Country Store catalog and inside is an old-fashioned wool dust mop, which up to 10 years ago I used and used to shake outside like my Mom used to do! Great question! I don’t know of any actual studies about the cleaning efficiency of an old-fashioned dust mop vs. Swiffer, but I know I prefer an old fashioned dust mop. Swiffer disposable dry cloths are made of polyester and polypropylene and work well to pick up dust and grime from most surfaces, but so does an old-fashioned wool dust mop. The natural lanolin in wool attracts and holds dust. Wool won’t scratch floors and gets better every time you wash it. I try to avoid single use products that go directly into the landfill, as well as petroleum-based products like polypropylene. The Swiffer wet cloths are treated with propylene glycol and though categorized by the FDA as “generally regarded as safe”, that’s not assurance enough for me. According to Swiffer, the wet cloths may irritate skin and aggravate known skin conditions.” Considering that concentrations of toxic compounds are higher inside than outside, it’s best to avoid them when you can. Indoor air pollution, partially caused by the use of chemical based cleaners, is a much more serious problem than people realize and one of the reasons for increased cases of asthma and allergies. Additionally, the chemically treated, single use wet cloths end up in the landfill leaching toxic chemicals into the soil and water table. There is no question that Swiffer is easier than an old-fashioned mop, but what happened to cleaning with natural and safe ingredients like soap, water, baking soda, vinegar, lemon juice and borax? All it takes is a little elbow grease and a good sponge mop. If you insist on the convenience of a Swiffer, there are similar, more eco-friendly options. Method Home floor cleaning mop with non-toxic compostable sweeping cloths. Gaiam’s Spray Mop Kit where you add your own cleaner or nontoxic vinegar and water, spray the fine mist and mop up with a microfiber cleaning cloth (the eco-friendly cleaning rage today). The set includes five washable MicroTech Cleaning Cloths. 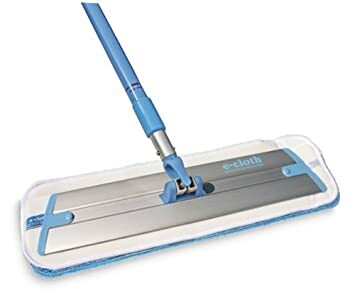 Amazon also sells a microfiber mop called E-cloth microfiber mop, as do Bed, Bath and Beyond and Whole Foods. I hope this helps Jennifer– let me know what you decide. Safe cleaning! Are Air Fresheners Really Fresh? By the time I got home from a ride in my friend’s car one day, my lungs felt tight and I was coughing. I knew immediately the air freshener in the car was the culprit, one of those new clip on air fresheners filled with a “scent” to eliminate car odors like food, dirt, and cigarette smoke. I decided I must post about this on my blog! Car air fresheners have gone from pine-scented cardboard cut outs of trees that dangle from the rear view mirror to the new plastic (more plastic!) containers filled with chemical scents. They clip on the air vent and are activated with the airflow. There are several brands with enticing names like Meadows and Rain, Hawaiian Aloha, or Linen and Sky complete with adjustable dials to control “freshness”. The Febreeze ad says, “In just a few moments, you and your passengers can all breathe happy.” I was not happy! The chemicals used in air fresheners are anything but fresh and do nothing to improve the quality of the air. They just mask the odors and in fact can be quite toxic. The National Resources Defense Council (NRDC) found that most air fresheners contain phthalates, which are at the center of a large debate about their negative health affects. High exposure to certain phthalates, also found in cosmetics, nail polish, paint and other everyday items, can cause cancer, developmental and hormonal abnormalities and can affect fertility. One of the active ingredients found in mothballs, 1,4 dichlorobenzene, is also found in some air fresheners. The EPA lists this ingredient as toxic since its vapors can affect respiratory function. There seems to be a correlation with air fresheners and asthma, according to the U.S. National Institute of Health Sciences. Other known ingredients that cause serious health issues are formaldehyde, acetone and terpenes. According to ehow.com, “These chemicals contain pollutants that, when mixed with ozone, cigarette smoke or dust can cause breathing complications, headaches and damage the central nervous system.” What’s worse is that companies aren’t required to list the ingredients if the product is labeled a “fragrance”. Air fresheners are everywhere – in the home, office and car. It is estimated that around 75 percent of American homes use some form of them, which amounts to more than $1 billion in profits for the industry. The best air freshener for your car however, is rolling down the windows. You can also easily make your own– a sachet with natural potpourri or dried lavender flowers, baking soda poured into an old sock and placed underneath the seat, or a piece of felt scented with a pure essential oil. You control how much scent you want! Play it safe and do away with air fresheners! One of my readers contacted me about unclogging her bathroom sink. As a conscientious environmentalist, she was surprised and frustrated when baking soda and vinegar didn’t unclog her drain. She was adamant about not using conventional, off the shelf products with lye and other toxic chemicals and wondered if there were other natural products that work. Baking soda and vinegar really do work, but it‘s important to use the right amount and follow the directions of this tried and true recipe I’ve listed below. For stubborn clogs, you may even have to repeat it a couple of times. Important: Do not use this recipe if there is standing water in the sink. Pour ½ to 1 cup of baking soda down the drain; slowly pour ½ to 1 cup of vinegar (distilled white vinegar is good) after. Cover the drain immediately with a cloth or rag so the fizzing interaction cannot escape. (This is the same fizzing action that happened when “erupting volcanoes” with the kids by mixing baking soda and vinegar.) Let it sit for 5 minutes or up to 30 minutes depending on the severity of the clog. Follow with a gallon of boiling water. If necessary, pour more boiling water down the drain or repeat the entire process. Some recipes add a cup of salt to the boiling water, followed by running warm water for 10 minutes to clear any product from the drain. If this doesn’t work, try using a sink plunger after pouring down the liquids. The plunger creates suction and forces open the clog. This procedure by the way also cleans your pipes at the same time. And unlike conventional chemical products, baking soda and vinegar won’t harm your pipes and of course not you or the water table. I used to tell my kids if you are ever stranded on an island, make sure you have baking soda with you. 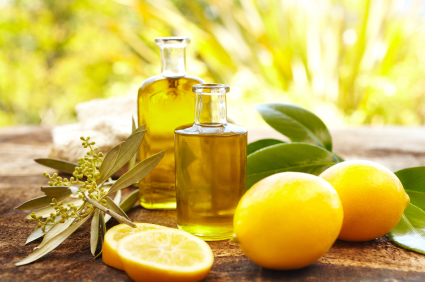 There are millions of uses – culinary, medicinal and for cleaning. Click here to read more. Information compiled from Home Comforts – The Art and Science of Keeping House by Cheryl Mendelson and thegoodhuman.com. 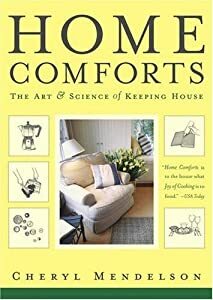 Home Comforts is a great book, a true encyclopedia of anything and everything having to do with the home.